JOHN, SON OF THE KING OF BERGEN. From Angus Mackinnon (tailor), South Uist. And the great impetuous stride. And 'tis not Diarmaid of the clear eye. That wended last night in the heavy glen. The gathering was hard throughout the moss. And the big man hard striding. And the precious woman between two scaurs. Though thou asked, it was not wise. A dh' imich an raoir 'san troma ghleann. Feadh na mointich bu gharbh truis. S am fear mor 's e 'na chruaidh cheum. S a' bhean leig eadar da sgoir. "Fhir mhoir ciod as mar seo?" Gad a dh' fharraid cha bu ghlic. To find out the race of a single man." A whole bone wouldn't be thy body within. Sure with their breath they would consume. The mighty spear that was in his grasp. Seventeen feet into the ground." And the leech will not make my healing. Yellow-haired youth of the curling locks." That thou didst not declare thy race. "That the head huntsman of Fionn. Gave thee battle in the heavy glen." Son of the fierce one of the sturdy tread." Thoirt gu slionneadh an aon duine. S dearbh gu 'n loisgeadh iad le 'n anail." An t-sleagh mhor a bha 'na dhorn. Seachd troidhe diag anns an talamh. S cha dean an lighich mo leigheas." Nach d' rinn thu do shloinneadh a dheanadh. Comhrag diots' anns an troma ghleann." Mac an fhir ghairg bu mhor trosd. Combat of five hundred pounds." I have not found this fragment anywhere else. 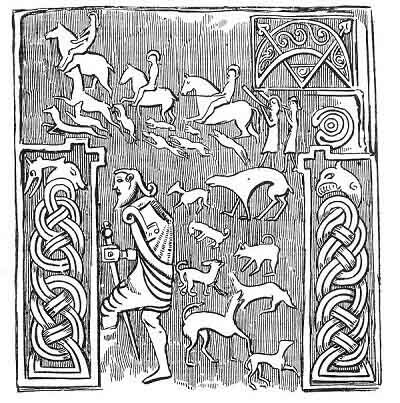 This seems to describe a raid made by the son of the King of Bergen, who carried off a woman, and was tracked and overtaken, and slain in a rift by Comhrag of the five hundred hounds, Fionn's head huntman. I am responsible for the division into stanzas of two lines. Siar generally means west; here it means behind, probably, for the same reason, that south and to the right are synonymous. A man facing the rising Sun has his back to the west, and his right hand to the south (deas). The left hand (lamh thosgail), to the north, and the sun (air a Bhevltaobh), on his mouth side, on Baal's side. This may be fancy, but unless some explanation is found, it does not appear how a man can have a north and south hand, and a western back. From Angus MacKinnon, tailor, Dallabrog, South Uist, who is a little dark-haired man, with quick-moving grey eyes, and lively, kindly manner. He wears neither shoes, nor stockings, nor bonnet, and seemingly never has. He sings these pieces with considerable pathos, and has a tolerably good voice. He appears to me to be about seventy years of age. Beirbhe. Dictionaries translate Beirbhe, Copenhagen, but it is more probably the Gaelic form of Bergen, which was formerly the capital of Norway, which is part of the Gaelic Lochlann, as well as Denmark. How Bergen may have passed into the Gaelic Beirbhe, may be illustrated by the frequency with which bh passes into g, or gh, and vice versa; thus, ubh or ugh, an egg; dubh, or dugh, black, etc., oov oog, doo. Comhrag nan coig ceudan con. Next: LXXVIII. The Master and his Man.